In the middle of World War II, the assassination of a German official made life very difficult for occupied Czech citizens. 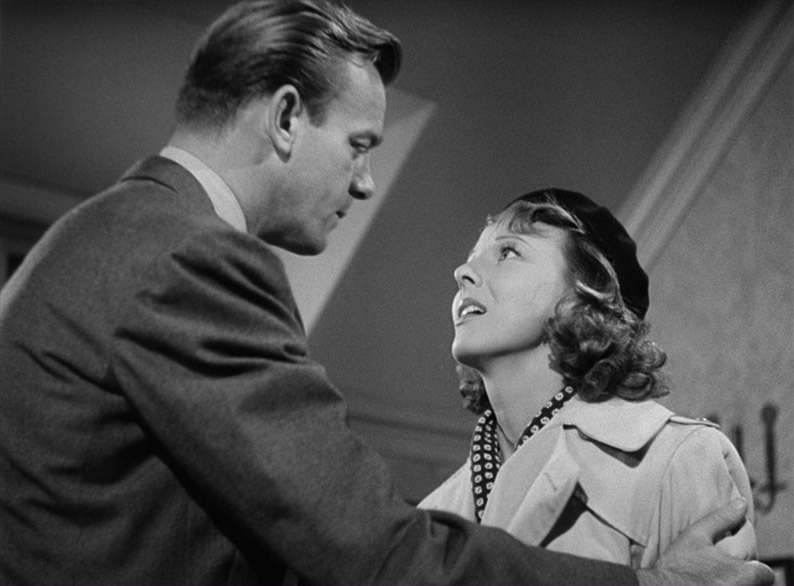 Fritz Lang's HANGMEN ALSO DIE tells this story with skill and suspense galore. Camus rues the facts and celebrates the fiction and reviews the Blu-ray from the Arrow Academy dual format release. 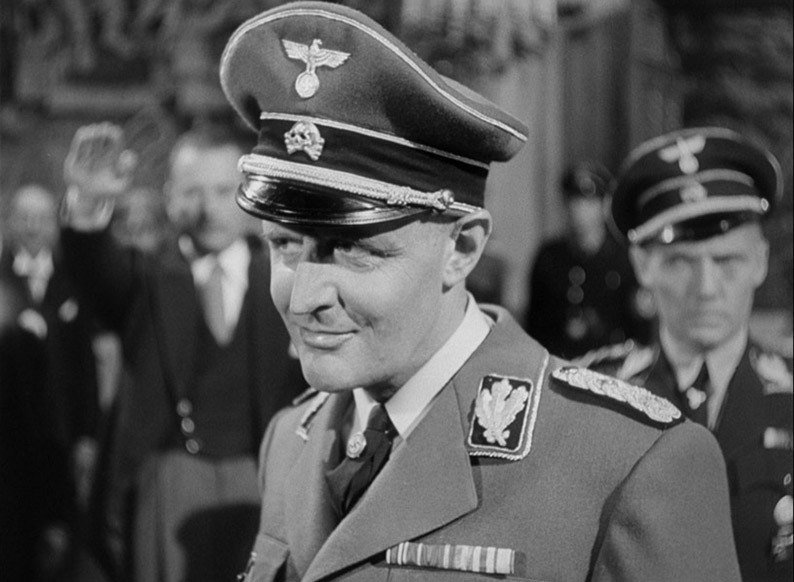 "When Goebbels offered me the leadership of German film, that same evening I left Berlin. So, naturally, at a time like this I think 'What should I say?' Otherwise, would I rather end up in a concentration camp? And I looked out the window and it was already too late to get my money." Any anti-Nazi media was welcomed in the US as by now a year had passed since the infamous attack by the Japanese on Pearl Harbour. The revered Austrian director of the superlative M, Fritz Lang teamed up with distinguished playwright Bertolt Brecht and came up with the story based on the real assassination while John Wexley takes the sole screenplay credit. As a student of and occasional actor in Brecht's plays, I experienced a real jolt to see his name rendered as 'Bert' in the front credits. He was held in such esteem while I was in education, that a shortening of his name seems almost disrespectful, like having a pint with Bill after he's knocked off the St Crispin's speech. Regardless of this, Bert's work is terrific; an earnest treatise on a population under occupation and what small but budding seeds take root in the consciences of hitherto untested human beings. Courage is one of the only human characteristics that cannot be faked (the appearance of bravery in a dangerous situation is by definition, bravery itself) and to see men who must have had their real life counterparts, quietly board the lorry that will take them to their deaths is always moving. Yes, a movie is acted but this was far from a fictitious occurrence. In one scene of its ilk, a poem is set to music and sung heartily by men who find a way to taunt their oppressors. "No Surrender..." It knocks on the door of Casablanca's Marseillaise for emotional resonance. The story, as based on true events, goes as follows. Protector Heydrich of the Nazi occupying army is determined to personally supervise the executions at a factory whose workers are on a go-slow to hinder the German war effort. As that despicable worm gets in his car, we alight on a taxi driver who is ordered to move on. 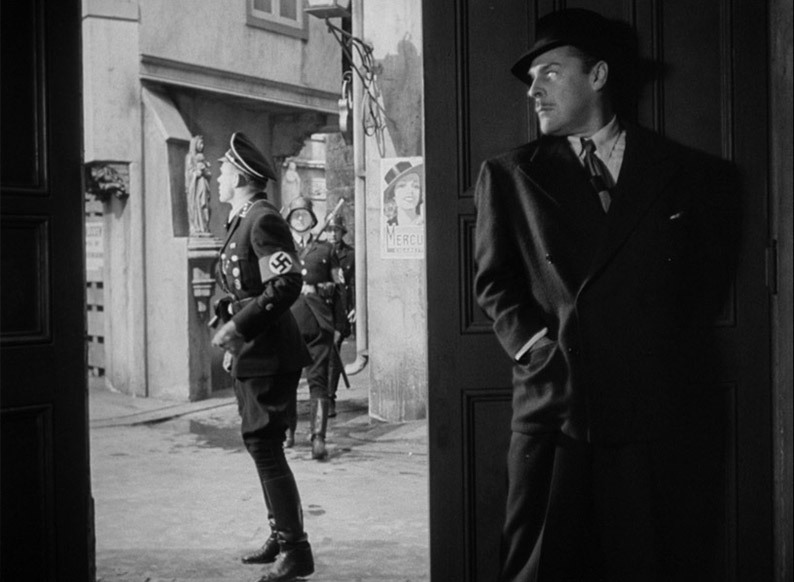 The assassin of the Protector (Dr. Svoboda played by Brian Donlevy) finds himself without a getaway car but is aided by Mascha (a seriously radiant Anna Lee), an ordinary Czech citizen who sends the Gestapo guards the wrong way. Nazi justice demands that fifty innocents of the four hundred rounded up will be executed every day unless the assassin gives himself up. Without realising it, Mascha's indifference goes from shock at being asked to harbour a 'criminal' to informing on him for the good of her captured father (a thin and uncharacteristically erudite Walter Brennan) to being an actor in a resistance role that could cost her life. To say much more will tip off surprises that are best left enjoyed as they reveal themselves. Making the resistance's cause more difficult is Inspector Gruber (Alexander Granach) and a few stoolpigeons who in these types of movies, as in life, are afforded a very special status as the lowest of the low. And to get lower than a Nazi takes real effort. You'd need to take lessons from a snake with a drill in the Bentley Subglacial trench. Trust me, that's low. The performances are earnest and convincing despite huge variations in thespian technique and several bad guys tipping gleefully into caricature. 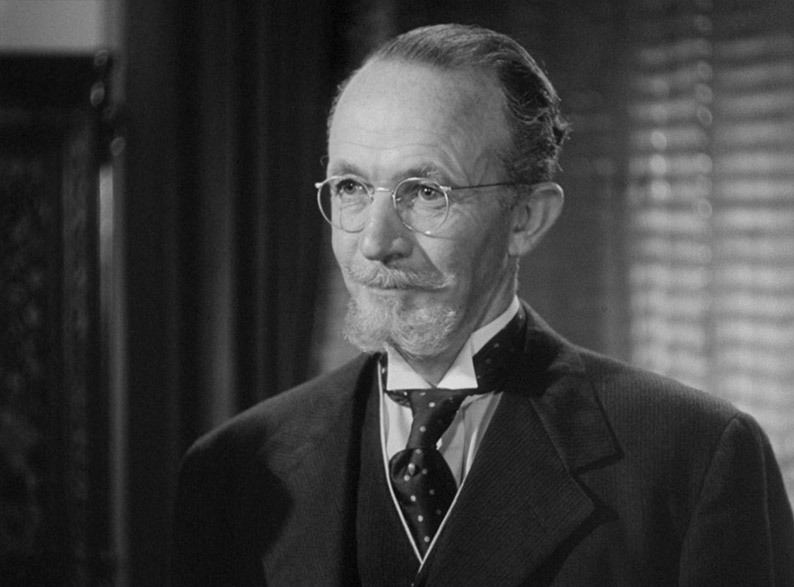 A lovely surprise coming at history from the wrong end is Walter Brennan. Throughout my film going career, this venerable actor has mostly been the older, limping, bent comic relief in a John Wayne picture, the crotchety old timer with the right moral code but not enough heft to enforce it without help. Together with Jack Nicholson and Daniel Day-Lewis, he shares the achievement of having earned three Oscars for acting, no mean feat. In Hangmen, he plays an intellectual, the heroine's father, tall and academically mannered. It took a few blinks to banish Rio Bravo's 'Stumpy' from my mind. He is the ethical and moral pillar of the movie and whose life is a morbid bargaining chip to the Nazis desperate to break his daughter. The first movie Quatermass himself, Brian Donlevy, plays the assassin, a reputable doctor whose conscience is faced with an difficult dilemma; give himself up for torture and death and hope the Nazis stop killing innocents or stay hidden knowing that more will die but the country will benefit from the morale boost. Donlevy has a very marked physicality, like he has been a marching soldier since birth wearing a cement waistcoat. It's a very distinctive look and he gives the impression that bending over will be quite a mammoth task. He even gets his own bit of James Bond business probably created by the editor Gene Fowler Jnr and editorial expediency than any claims of 'cool'. At 8 minutes and 58 seconds, he has to change from all black assassin jersey garb to a normal shirt and tie and it's all done in one swift cut. He didn't go as far as putting a flower in his lapel but Connery in Goldfinger was never far from my thoughts. Having what seems like a lot of fun in his role (until things get a little too hot to handle) is the confident and hedonistic Inspector Gruber (Granach). The human face and caricature of the Nazi character in this drama, he's the wily detective of the Gestapo, the most dangerous man to the resistance. This isn't to say the man is a Sherlockian carnival of intelligence but he's an excellent foil to the desperate opposition forces and their attempts to outplay the Nazis politically as well as strategically. Hangmen also plays smartly with audience expectations. Lang was insistent that the Germans were played by Germans and the Czechs by Americans so Mr. and Mrs Johnson from Iowa could start to imagine what it may be like living in an occupied country, something the Americans have never had to really worry about. The plethora of US accents on display is dazzling but somehow it's not too much of a shock to hear the heavy Brooklyn drawl of Lionel Stander one minute and the cut glass received pronunciation of Anna Lee the next. The drama and mise en scene are so secure, you could have had any accent and the narrative would still survive. 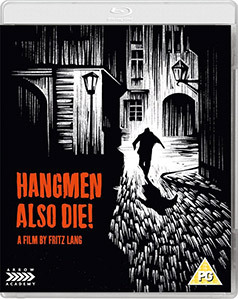 Hangmen Also Die is a solid and entertaining line on the Fritz Lang CV and unjustly compared to his two bona fide classics. If you like fine war movies heavy on the power play, light on the warfare, then give Hangmen a look. Presented in the 1.37:1 aspect ratio, Hangmen looks terrific. While the clean up hasn't removed every spot of dust and minor scratch, (damn close, I grant you) there are what must have been unfixable frames, damaged beyond repair, best snipped from the film and skipped over with a jump cut. This trips you up every so often though these moments are not as frequent to be upsetting. If you were more forgiving you may even suggest that this modern habit of using jump cuts may have been started by Mr. Lang. But that I seriously doubt. The mono soundtrack is never muddy and I think I caught every word with no effort required on my part. They knew how to record dialogue in those days (we forgive the hum and pops of the optical soundtrack). There are optional English subtitles for the deaf and hard of hearing. Interestingly (and I think this may be the hallmark of these subs) the German is not translated unless all the German spoken in the film can be translated as "Speaking German". As non-German speakers, we are left in the dark as much as the other characters are and have things explained to us through those characters. This informative accompaniment to the film is from a professor of film studies and a former director of the New York Film Festival. Of the many gems in the commentary, here are a few notable ones. All these years I've been saying 'Peter Lorre' as in transport 'lorry' but Peña pronounces it 'Lora' so that's me told. It seems the great actor was simultaneously working on a Brecht play and got the two greats together. Brecht eventually fell out with Lang (those pesky creative differences again). The use of the German language is deliberately untranslated to allow the viewer to side with the Czech citizens all of whom were played by Americans in an attempt for some audience empathy. There is some criticism of Donlevy and Lee and despite the marked differences in their acting styles, I saw no problem with their performances at all. It seemed that Brecht believed that the German people would eventually overthrow Hitler. That idea didn't quite pan out. Peña is definitely near my own age. His comments on Walter Brennan bear that out as he says almost exactly what I've written about him being wedded to his cowboy parts. He also mentions the cab driver's suicide (Lionel Stander being noble) but as we never see how high the building is, the idea that he jumps to his death is by no means the first reading of the event. The quasi-romance between Lee and Donlevy (an aspect of the narrative Lang hated) was "...what the American public expects..." "We don't make mistakes here!" is highlighted as one of the more unfortunate lines in the film. Halfway through, the commentary gets sparser and Peña adds scene specific sidebars until he rarely pops up in the last third. But overall, his contribution to the appreciation of this film is worthy and well worth a full listen. Professor Gerwarth is amiable and knowledgeable and this extra is essentially very few clips of the film to illustrate the actual truth of the story as told by Gerwarth in two talking head shots. There's an interesting filmmaking lesson to be learned from the coverage of the interview. The straightforward mid shot doesn't elicit any particular emotional reaction – it's a talking head, very simple, nice designer glasses. But the moment we cut to the close up, shot from the side at a slightly lower angle, Professor Gerwarth becomes a movie villain... Being shot from that angle flatters no one except Darth Vader. This is a solid and informative extra that gives a little truthful frisson to the movie's dramatic invention. A simple little split-screen nod to the restoring process. The original print or inter-positive looks washed out and has very low contrast et voilà! Look how much contrast and detail in the contrast there is. For technical buffs. It's less than riveting as an extra. For once I'd like to see the practical process involved in cleaning up a print of this vintage. One for next time. This falls wonderfully between two stools. It is neither the original trailer nor wholly a modern one. It apes the sensational nature of trailers in the 40s with lurid text splattered over the screen and trenchant music but the neat Helvetica white text on black gives away its modern aspect. It certainly sells the movie but I suspect film aficionados will hunt this title out and won't need any trailers to sell them on it. That said, I'm hooked! A terrific suspense yarn, one Hitchcock himself would be proud of. Lang's careful control of his images and his sometimes startling uses of chiaroscuro, effervesce from every scene. He makes you feel the helplessness of the occupied citizens while we can vicariously enjoy every small victory against an implacable foe. Just over two hours of a damn fine war movie – well recommended.